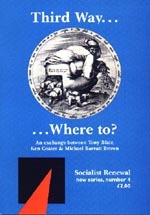 When the third way was invented, not the least of its attractions to its promoters was that if offered a convenient bridge to enable President Clinton to take a position on the same platform as European Socialist Prime Ministers, without undergoing an inconvenient 'conversion' to some form of social democracy. The Third Way was a perfect foil for such an impostor. It afforded a media-friendly cover for the extension of neo-liberal politics of deregulation, the untrammelling of market forces, privatisation and the roll-back of welfare. 'The ideas associated with the Third Way are still the wave of the future for progressive politics' says Tony Blair. Ken Coates and Michael Barratt Brown examine what this 'wave of the future' has brought us, and where it may yet wash us up.